Sometimes in the middle of the week it’s good to mix things up a little. So last night I decided to roast a turkey. We usually end up with a free turkey after Thanksgiving from our local grocery store who awards them to customers who spend over a certain amount the month before Thanksgiving. The Wednesday night turkey is the perfect solution to free up freezer space and get a whole lot of meals for a little effort. I have been asked more than once how to roast a turkey so here it is. First if you’re dealing with a frozen turkey you want to pull it out of the freezer 3 to 5 days ahead depending on the size. If you want to speed up the thawing process you can give your bird a warm bath in the sink. It’s best to use cold to luke warm water for this. If the water is too hot you can actually start cooking the meat a little and you definitely don’t want to do that. Once you’re turkey is thawed you need to prep it. I take my rack from my roasting pan and put it in the sink so that I can prep my turkey on the rack and simply lift it to my roasting pan when I’m done. Unwrap your turkey, remove all the packaging, be sure to reach in and grab out the neck and giblets that are usually stuffed inside the turkey. I rinse my turkey off with a little cold water. Everyone likes a tender turkey and I like my skin to be golden and a little crispy. Here’s my secret, butter, Paula Dean would be so proud. There’s a few ways to butter a bird. You can massage the butter into the skin. You can melt your butter and pour it over or baste it on. 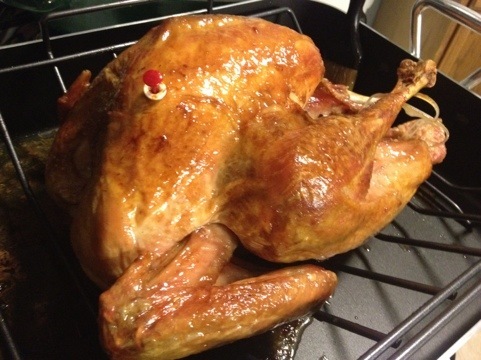 You can inject your turkey with melted butter in which case I’d baste the skin a little too to make it crispy. Finally you could just lift the skin and slide some butter underneath. All are good options. I usually just apply my butter to the skin because I don’t want add to much extra fat to my meat. I stuff my turkey with apples and pears to keep my meat moist and to help my turkey cook evenly. Now it’s time to roast. Preheat your oven to 350 degrees. Remember the golden rule 20 minutes for every pound of meat. So for a 10lb bird that’s 200 minutes or 2 hours and 40 minutes. I cook my bird uncovered for the first half to start my skin crisping and to get a nice brown color. Halfway through you want to either start basting or cover your turkey with foil to keep the juice in. If you choose the basting method you’ll want to bast every 20 to 30 minutes. When you’re turkey is done take it out of the oven and let it rest for 20 to 30 minutes before carving. The best part about the Wednesday night turkey is the leftovers AND meals for the rest of the week are halfway done.